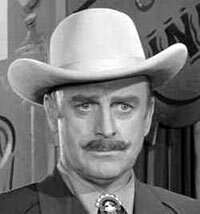 When stern-faced John Dehner rode into town, his wide hat brim casting a dark shadow over his steely blue eyes with just his thin mustache and firm grimace showing, you knew Matt Dillon, Paladin, Lucas McCain or whomever was in for trouble. A consummate actor, Dehner could also bring off comedy equally well, which found him, especially as he grew older, on “Andy Griffith”, “Hogan’s Heroes”, “Beverly Hillbillies”, “Love American Style” and as a regular on “The Doris Day Show” (‘71-‘73). 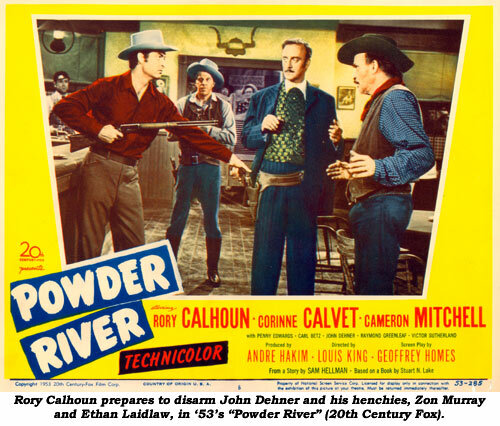 Also playing against his “heavy” type, he was crusading newspaper reporter Duke Williams on “The Roaring ‘20s” (‘60-‘62) and dramatized many sympathetic roles on various TV westerns—he was never better than on a “Gunsmoke” as lonely Caleb Marr, who, bored with toiling on his farm, decides to live a little and heads for Dodge City. Born John Forkum November 23, 1915, in Staten Island, N.Y., the son of an artist, he was educated through grammar schools in Slemdal, Norway, and at the Lycee Carnot in Paris, France. He attended high school at Hastings-on-Hudson, N.Y., and at the University of California. Dehner was a man of many talents, not the least of which was a thorough knowledge of four languages. As a radio news editor during WWII he received the Peabody Award for his coverage of the first United Nations Conference in San Francisco. Unlike many actors, Dehner’s career didn’t begin on the stage, he started out as an animator for Walt Disney, working on classics like “Bambi” (‘42) and “Fantasia” (‘40). Previously, as a musician, he was musical director of a touring stock company and a band leader. In 1944, post WWII service, his rich, well-modulated baritone voice landed him dozens of roles on all the top radio shows—“Escape”, “Phillip Marlowe”, “Count of Monte Cristo”, “Gunsmoke” and dozens more. 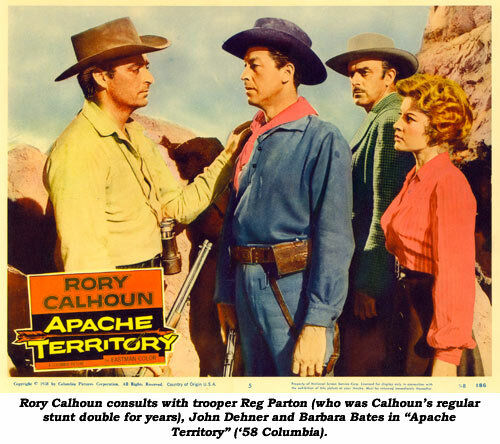 He starred as CBS’ “Frontier Gentleman” in ‘58 as well as the radio version of “Have Gun Will Travel” from ‘58-‘60. 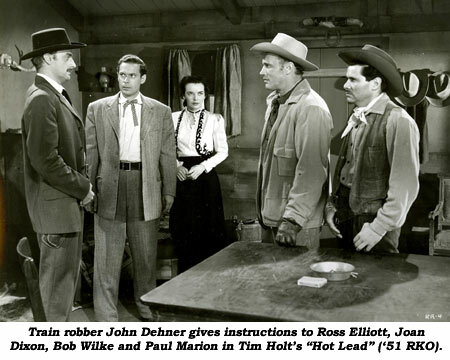 Dehner also starred for a season on “Pursuit” (‘51-‘52), replacing Ted De Corsia, and “The Truitts” (‘50-‘51) sit-com. 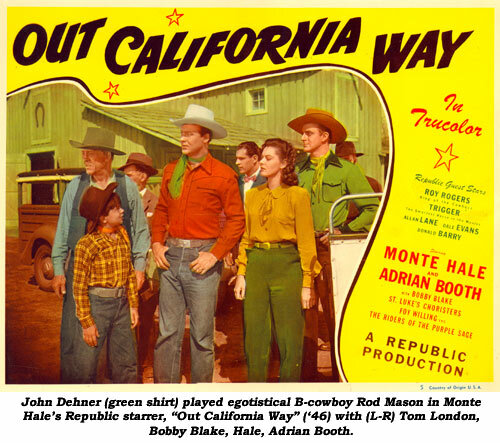 If this wasn’t enough to keep him busy, Dehner began his 150-movie screen career with bit parts in ‘44, gradually working up to better parts, such as his first western portraying egotistical, temperamental western star Rod Mason in Monte Hale’s “Out California Way” for Republic in ‘46. 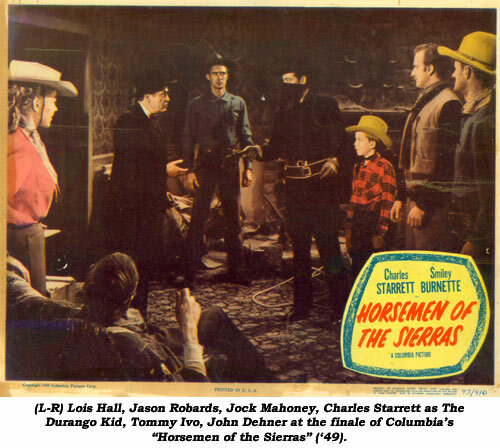 Then came other B-western heavies opposite Charles Starrett, Tim Holt and George Montgomery. 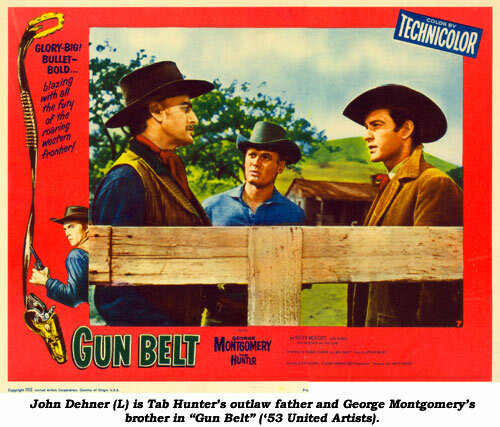 Apparently with still not enough to occupy all his time, the obviously workaholic Dehner began doing television in ‘52, eventually amassing hundreds of credits including all the major TV westerns. In 1960 he essayed the role of Burgundy Smith, constantly perplexing Brian Keith on the short-lived “The Westerner” (‘60). For half a season in ‘65, Dehner became Morgan Starr, in charge of Shiloh Ranch on “The Virginian”. Dehner continued to work into the ‘80s, with his last role that of an admiral on the mini-series “War and Remembrance” in ‘88. Dehner died at 76 in Santa Barbara, CA, of emphysema and diabetes on February 4, 1992.